Before I delve into how this momentary linguistic delusion took hold, I should offer a brief explanation of the evening's performance and the venue. In a nutshell, Dastangoi is a narrative adaptation of the 'Tilism-e-Hoshruba,' dealing with the exploits of Amir Hamza, the Islamic warrior, against the emperor of sorcerers, Afrasiab. One of many exciting cultural events to take place this week during the 'Muslim Voices' festival, the evening's performance, adapted and directed by Mahmoud Farooqui a Delhi-based writer and performer, was truly a marvel. The headquarters of the Asia Society, one of the organizers of the festival, was the perfect venue for this masterly exercise in storytelling. It's no easy feat to transform a modern stage into a setting so intimate that a sensation of ease and warmth is present as in one's living room. The stage, a low wooden platform with a mattress and pillows, two candles on either side, two books, two silver cups and a water pitcher, was elegant as it was humble. b warrior's adventures, the Urdu dastangois, through repeated oral tellings over generations, so expanded the story that it took a wholly new life and color. It became wholly indigenized, Indianized, in spirit, details and context. - that is, a trickster. In any case, the story itself, despite its conventional framework of good triumphing over evil, was littered with surprising moments of plot twists and gorgeous, otherworldly settings. For a start, it takes place in the Tilism-e-Hoshruba, a magical realm between the earth and sky, obscured by a river of fire. In one tale Amir Hamza's best friend Amar and the ayyaar Barq battle Azlam Zadu and his dragon army. In another, Amar saves the sorcerer Aafat's life disguised as the latter's wife Hilal. But turning back to linguistic delusion, several times during this performance I really believed that I understood Urdu (and the ten words that are shared with Arabic). An unlikely occurrence, since there was literally a super title (the opposite of subtitle for those who do not frequent the theater) every five minutes, the rest of the monologue was only understood by speakers of Urdu. In other words, the dasntangos had cast a multi-layered spell on me, like the sorcerers in their epic tales. A spell of time-travel transported me to the jasmine-scented court of a Mughal monarch where I was the lowliest servant, where too ignorant to comprehend the linguistic niceties of court tales I stood in desperate enchantment at the raw skill of the storyteller. Living proof that the performative elements of storytelling are a universal language: one of tone, gesture and, last but not least, talent. The lack of adornment, whether musical or visual, highlighted the real oral virtuosity of the performers. Sadly, I could never fully comprehend the delight felt by native speakers of Urdu that night, but for a moment in the breakdown of time and space, I believed I did. The story-telling tradition may be a dying art form but a performance by Mahmood Farooqi, with star-power lent by Naseeruddin Shah, made a strong case for the future. One of the more popular genres of stories in the Islamicate world is the dastan, or tale. The tales of Amir Hamza are a favorite set of stories. Purportedly about the exploits of an uncle of the Prophet Muhammad, they are a collection of fantastic stories chronicling his deeds and exploits. In Urdu, the tradition appears to be tied to the poetic tradition of the masnavi, which involves the creation of fantasy worlds where the heroes battle their foes. Although we now conceive of the dastan as a printed tale, like much Islamicate literature, it has a strong oral component. The dastangoi, or story-telling tradition, is a dying art form according to Mahmood Farooqi, who organizes dastango , story-tellers, to revive the art. He recently staged a production for the Muslim Voices Festival in NY, featuring Danish Husain and renowned actor Naseeruddin Shah. Shah seems to have been brought for his star appeal for the festival, but he was very good, as were both Farooqi and Husain. Rachel Cooper of the Asia Society began the evening with a short, informal introduction to the tradition, followed by Farooqi's more formal introduction. He cracked a joke that while the East was developing stories, the West was developing technology, and he wouldn't have it any other way, showing the deep cultural impact of stories. Both Farooqi and Husain talked about the etiquette of the performance. In a traditional setting, there would be more performer-audience interaction, but in this setting, they had to get through the stories. In addition, rather than clapping at good lines, they encouraged the audience to cry out "vah vah," the equivalent of a "bravo," and normative for oral performance settings. Farooqi also comments that the dastan offers us a way to see how being Muslim has changed over time; he pointed out that in an earlier time Muslims had no qualms about mixing the sacred and profane, with the Prophet's "uncle" appearing in a fantasy tale. When the performance began, there were only two actors on-stage, Farooqi and Husain, seated. They played all the roles of the tale, which did not include Amir Hamza, but his companion Amar Ayyar, a trickster character. One of the striking things of the performance was it's fluidity. The dastango rarely looked at one another, they were telling the audience the story, and as their passions increased, we were brought into the tale, breaking the fourth wall. We were part of the magical world they conjured, not as active participants, but as actors still. One of the key questions I had was "why should we care about a dying art form? why should we revive it? what is the value?" Being drawn into the performance helped to answer these questions. The written text is fixed. The meaning is given, and rarely is it discussed. One walks away with a fixed understanding that usually reinforces the reader's view of the world. In a performance, the text is liquid, it changes on context. It is inherently communal, creating a sense of belonging and contested meaning. The set-up is simple, with two dastango sitting and spinning the tale, with no music, props, or real acting outside of the face and some simple hand gestures. While we think of religious texts in this way — does Qur'an mean "reading" or "recitation" for example — but popular texts are different matter. However, any culture is made up of more than religion, and the popular must also be contested space. 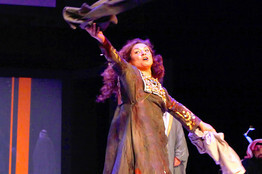 The second act sees actor Shah replacing Farooqi on the cushions, and Farooqi retreating to a dark corner of the stage. With Shah's appearance, there is far more interaction between the two dastango, reintroducing the glass wall. However, the performance was still engaging, and while the first act possessed some archaic language as befits an old story, the second act introduced some modern terms and English loans, highlighting the living nature of the material. The inclusion of Indic material with Islamicate material hinted at a rich cultural collaboration that I wish was further explored in notes or on the website. Terms like "sati," or bride immolation, were used for Muslims, a practice that is more closely associated with Hinduism. There also seems to be an undercurrent of Islamic supersessionism involved, where the heroes' mythic adversaries are problematic parts of Indic cultures. These are relatively minor complaints. Perhaps the biggest problem of the evening was the poor super-titles for the performance. They was almost non-existent. While a direct translation may have been difficult for a text that seems to change slightly each performance, better real-time summaries were needed. Farooqi's vision for reviving the dastangoi tradition is an admirable one, and his expert staging and acting show the value of the art form in a way simply reading about it does not. The performative aspect of the night was powerful, even if one could not follow the language, as many in the audience could not. With continued shows like the one in New York, and Farooqi's success in South Asia, he is well on his way to reviving this tradition. There's no doubt that the 10-day Muslim Voices festival staged around New York City that ended on Sunday featured some highly superior expressions of Muslim culture past and present -- or, one should say, expressions of culture from Islamic countries, because the organizers did not intend the festival to provide a coherent impression of what constitutes Muslim culture. Indeed, they explicitly intended the reverse. Americans have a monolithic, negative and superficial view of Islam that the festival was meant to correct, the organizers repeatedly said and wrote. As a result, theirs was a scattershot approach, offering what the program called "kaleidoscopic richness" from 20 countries and presenting everything from calligraphy to music, movies, video, theater, film, interviews and the like produced by more than 100 artists and performers. The festival took three years to produce, cost $2.5 million and was a collaborative effort of three main organizers: the Asia Society, Brooklyn Academy of Music and New York University's Center for Dialogues, a post-9/11 think tank dedicated to fostering understanding between Islam and the West. In the opening two-day conference, the organizers laid out their agenda with the recurrent mantras that such occasions produce. Diversity: good. Clash of Civilizations: bad. And it's usually the U.S. that gets tainted with responsibility for the "bad" side. Sure enough, Mustapha Tlili, director of the Center for Dialogues, noted that cultural exchange could do only so much when real policies caused real problems. He cited, among other items, the "the pain of three million displaced Pakistanis, the exertions of Iraqis longing for peace, the frustration of Iran in the nuclear arena" as "acutely felt grievances in the Muslim world." He added that "these are not issues that can be addressed in this event." Nevertheless, the seemingly unexceptionable nature of the festival's premise -- to enhance mutual understanding between cultures -- had its own problems. For one thing, such painstakingly well-meaning projects often produce achingly dull results, more earnest than entertaining. The festival offered several such examples, among them the Youssou N'Dour documentary "I Bring What I Love," a portrait of the Senegalese performer as he made his Grammy-winning album "Egypt" that proved dismayingly inchoate and overworshipful. And, as always, there was a musical-fusion event offering painful why-can't-we-all-get-along music. This time it was an "evening of musical exchange between Christian/African-American gospel music and qawwali, the 700-year-old tradition of Sufi praise music." The festival did bring to audiences several examples of true cultural artistry for which the organizers should be warmly congratulated. Only, one doubted that many Muslims attended events like these in their home countries. How typical of broader Islamic culture were such events and how much should they alter American impressions of prevailing cultural standards in Islam? In the area of theater, for example, BAM featured "Richard III: An Arab Tragedy," an outstanding cultural achievement by any standards -- but how many in the Muslim world would be affected by it? The "Richard" project was originally commissioned by the Royal Shakespeare Company and is the creation of renowned Kuwaiti dramatist Sulayman Al-Bassam. In Arabic with English subtitles, it's a startlingly original retooling -- at times kitsch and macabre; at others, farcical -- of the Richard III story around a Saddam-like figure. In the program, Mr. Al-Bassam points out that Iraq under Saddam was a Republic, whereas this story is set in a kingdom not unlike one of the Gulf states. It came as a surprise to me to learn that the play had been publicly performed in Kuwait and Syria, altering my view of what was possible in such countries. But did it alter the views of many citizens or their rulers in those countries? And what about Yemen or Somalia, where no one would see it? How many Muslims world-wide go to the theater as opposed to fundamentalist mosques? To take another example: At the Asia Society, "Dastangoi: The Adventures of Amir Hamza" was performed simply by two storytellers in white silk outfits sitting on a low wood platform with cushions. They were joined by Naseeruddin Shah, an Indian film actor and celebrity, who provided the evening's star turn. As they explained with fluent poise in perfect English in the introduction, these were centuries-old oral tales derived from Persian epics that relate the near-occult adventures of Amir Hamza, a purported uncle of the Prophet. The traditions attained a peak in 19th-century Lucknow, India, when thousands would turn up for days to hear the verse-epics of love, war, betrayal and sorcery. The last old-time Dastangoi, or practitioner of the art, died in Delhi in 1920. Faced with two hours of nonstop Urdu, I expected the worst. But the performance proved riveting. The perfectly pitched musicality of the voices, by turns lyrical and humorous; the astonishing plasticity of facial expressions; the infinitely varied hand-gestures -- suddenly, I was staring down the centuries at a civilization's golden moment. This, I thought, is how all those figures in miniatures would sound and act if they came to life. Unquestionably, Islam produced great culture -- and if Americans don't know that, they should. But how many Muslims are exposed to this art form today, and therefore why should it change anyone's "monolithic" view of contemporary Islamic culture? I had similar thoughts about the extraordinary new IMAX film "Journey to Mecca" at the American Museum of Natural History. The visually magnificent movie features a dramatization of 14th-century Muslim savant Ibn Battuta's religious pilgrimage, bookended by vistas of the hajj in progress, for which the (Western) filmmakers got special permission to shoot footage in and around the holy site. The museum's 800-seat auditorium was sold out -- and, indeed, the film sells out wherever it gets shown, even in the West. As a form of cultural diplomacy, "Journey to Mecca" can hardly be bettered -- it comes closest to plugging some of the holes in the festival's premise: Here is the heart of Muslim culture; this is a glimpse of what all Muslims share, highbrow or low, African, Arab, Asian or European. Yet nothing in the festival could ultimately fulfill the organizers' agenda, because they presented as examples of Muslim-culture artforms that mostly Western or Westernized Muslims consume. How many Americans will believe -- and why should they? -- that any of this reveals the prevailing culture of the vast majority of today's practicing Muslims? That monolith, rather than the one of American preconceptions, would most benefit from exposure to the festival's finest offerings. Mr. Kaylan writes about culture and the arts for the Journal.